Out here, they are working villages, and the landscape is an ordinary agricultural one of worked fields and lost hedgerows, with the occasional intrigue of a secretive copse or woodland. The main Downham Market to Kings Lynn road threads through to the east, but Runcton Holme is a pleasant, sizeable village with a quietly self-sufficient air, as comfortable as its name. The church sits in a field above the village street. There is no reason whatsoever for it to be kept locked, and the signs on the door suggest that it was once left open as a place of spiritual refreshment to pilgrims and strangers; but those days are past, and you must collect the key from the bungalow at the bottom of the bumpy lane. The exterior of the church is attractive, and slightly curious. 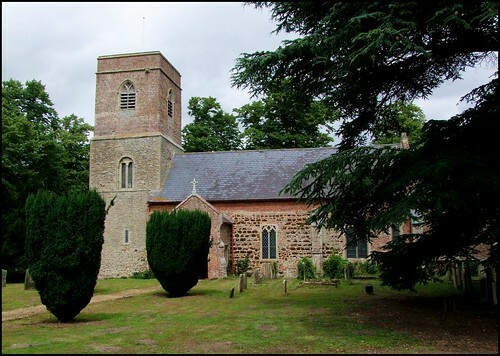 It is largely a mixture of the three great East Anglian materials, flint, red brick and gingerbread carstone, but it is unusual to see them all in the same building at once The lower part of the tower is a grand Norman survival, an unusual sight, especially when topped out with red brick, and with a very late medieval red brick porch against the nave below. The porch is not large, but seems it - this is a small church. The south doorway gives away the fact that it is also essentially a Norman church, and the body of the nave is older than the tower, which is in an almost clumsy juxtaposition to it. At some point in the 20th Century, this church was obviously the subject of some considerable Anglo-catholic enthusiasm, and one of the survivals of this is a splendid window by Veronica Whall of the Marys discovering the empty tomb on Easter morning. It is quite her best work in East Anglia. The Whall window stands out all the more because this is a very plain, very simple church otherwise, the fruit of an early restoration in 1842. There are a few earlier survivals, but not much has happened since, apart from the window. The font is plain and simple, and probably of the late 14th Century. There are intriguing heads looking down from the chancel arch. The grand pulpit of the late 17th Century is supposed to have come from elsewhere. A ledger stone from the following century notes that the lady beneath is Safe from Life on that Eternal Shore, where Sin and Pain and Sorrow are no more. St James is a good example of a church which is, above all, a touchstone to its parishioners down the long generations. I came here with local historian and writer Paddy Apling, and as we chatted about this, I put my hand on one of the 19th Century poppyheads on the end of one of the small benches which were put here in the 1842 restoration. I was surprised by how cold it felt, and on closer inspection I discovered that the poppyheads were, in fact, made from cast iron. Now, this seems a perfectly reasonable, even sensible, material out of which to make them, but I had never come across this kind of thing before. Or had I? It made me wonder if this was just the kind of thing which I had easily missed when being too dismissive of a workaday Victorian restoration. I will have to look more carefully in future.